CNN reports that Sadler’s “joke” fell flat. 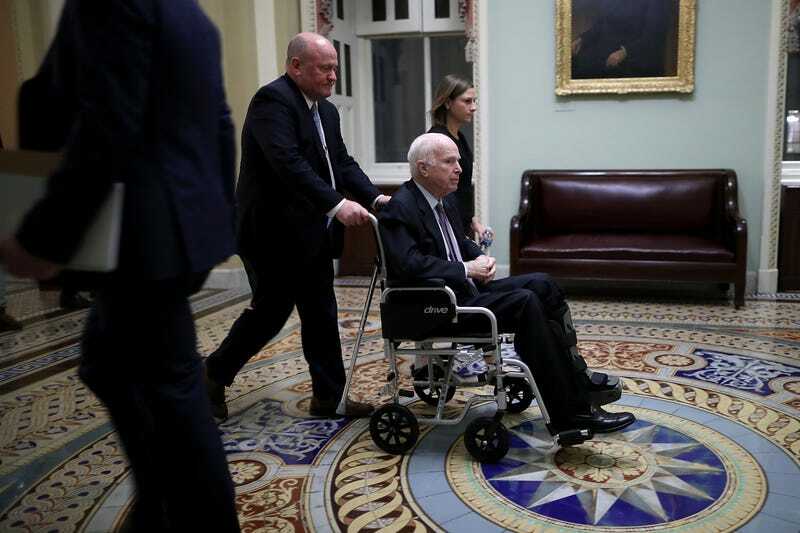 McCain (R-Ariz.), who announced last year that he’d been diagnosed with brain cancer, has been absent on Capitol Hill for long stretches since the diagnosis. He recently noted that when he dies, he doesn’t want President Donald Trump to attend his funeral. On Wednesday McCain, who has been a staunch opponent of the use of torture, called for his fellow senators to oppose Gina Haspel’s nomination for CIA director because of abusive interrogation methods used by those under her watch. McCain called Haspel a “patriot” in his statement Wednesday but implored senators to vote against her confirmation. Sadler reportedly called the senator’s daughter Meghan McCain on Thursday to apologize for the comment, and a White House official issued a statement to CNN about Sadler’s comment. After learning that McCain was against her confirmation, Haspel issued a statement noting that she has the “utmost respect” for one of the longest-serving senators in history. “I have the utmost respect for Senator McCain, and I appreciate the thoughtfulness with which he has approached this nomination process,” she said. The tension between the White House and McCain began last summer after McCain traveled to Washington, D.C., to record a no vote for Trump’s effort to repeal Obamacare. McCain’s dramatic thumbs-down was the official nail in the coffin of a tightly contested proposal. South Carolina Republican Sen. Lindsey Graham, a close friend of McCain’s, warned that McCain’s health is no joking matter.